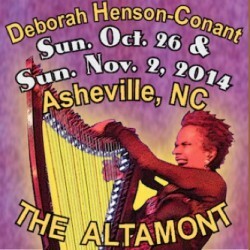 Grammy-nominated vocalist and electric harpist Deborah Henson-Conant will be bringing her annual “Lose Your Blues” show to The Center for Arts in Natick (TCAN). Buy ticket now for $1 or $2 or $10! Then come to the show from your laptop, text-chat with the other folks watching (and me!) If you love what you hear, drop some more in the tip jar! Deborah Henson-Conant is bringing her one-woman show to the scenic seaport village of Rockport. 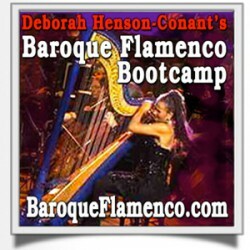 Stories, humor, and music from Blues to Flamenco with sounds you never thought could come from a harp. WHAT: Solo Show & EP Release! Pay what you want. Come for 5 minutes or 5 hours. Take a Harp. Shrink it down. Strap it on. Plug it in… Deborah-Henson Conant is bringing her solo show to Dreamland in Nantucket. A collaborative project I’m doing as a composer & performance coach with Boston University’s chamber music program and their faculty concert series. It’s a concert of my works for soprano and chamber ensemble based on stories of mythic women. HipHarp Toolkit – Latin Style! 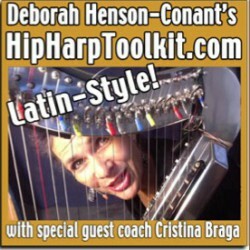 10-Week Online “Hip Harp Tookit” course with 10 bonus mini-lessons in Latin Styling from Cristina Braga. In this 10-week course specifically for harp players (lever & pedal), harpists learn the fundamentals of solo arrangement so they can liberate themselves from the written page and create their own arrangements from simple melodies and bass-lines. This course teaches harpists the fundamentals of arrangement structure, the basics of what to do with LH and RH, how to simplify difficult pieces and how to embellish simplistic ones. Click Here for more Course info. It’s music, ideas and humor in a presentation that is both concert and lecture, both listening and interactive for the audience. ‘Strings of Passion’ plays out 7 principles, string by string, to show how they resonate and harmonize with each other. The principles: invention, collaboration, leadership, structure, character, exploration & lift-off as idea becomes reality. 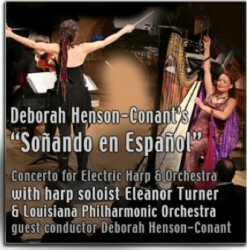 Concerto for Harp & Orchestra by Deborah Henson-Conant with featured harp soloist Eleanor Turner & The Louisiana Philharmonic Orchestra Guest Conductor Deborah Henson-Conant. Included in the performance: Three Movement Concerto composed by Deborah Henson-Conant. Performance part of the 2014 AHS Conference. For those who can’t come to New Orleans for the LIVE “Strings of Passion,” I’m performing a special livestream version. 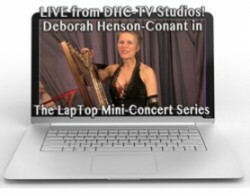 Learn the 7 principles that take me from creative impulse to the lift-off of personal expression: music, ideas & humor in concert – live with the 32-string hip-harp. 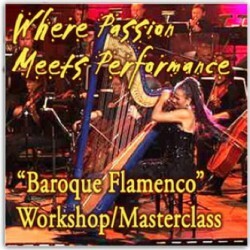 The masterclass and workshop with guest coach Eleanor Turner, includes an overview of the playing techniques and character-performance for my piece “Baroque Flamenco” and hands-on coaching for soloists and chamber ensemble. Soloists will be chosen by audition. 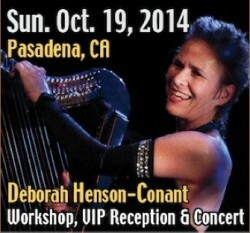 These two events are in conjunction with the 12th World Harp Congress. This concert is a Chamber Ensemble concert with harp soloist and 8-Piece Chamber Ensemble including pieces from my “Invention & Alchemy” suite: Baroque Flamenco, 996, Danger Zone. 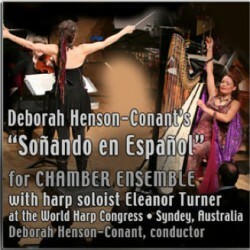 Performance part of the 2014 World Harp Congress. The Opera House Bar is sooooo close to the Opera House and I’ll be weilding my 32-string electric body harp in an early evening set reminiscent of my old jazz days. The show is from 18:50 – 19:40 (6:50 – 7:40), so if you’re down under, come on over! 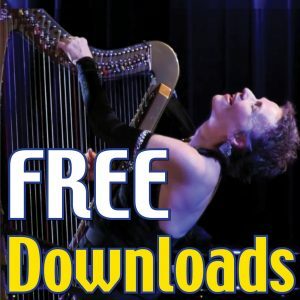 In this 7-week online course, harp players of all levels liberate themselves from the written page and learn to arrange music at their own level. While you can apply the principles of “Hip Harp Toolkit” to any style of music, the Fall 2014 session uses Holiday music as a basis for exercises so that participants can develop a repertoire of music they can put into practice immediately at Holiday events. I’m returning to one of the world’s greatest intimate listening rooms – the Altamont Theater in Asheville, N.C.
Tix on Sale for both shows NOW! I know it’s not so cool to put something on the tour list that you can’t actually come to, but I”m so excited about this that I want to let you know! 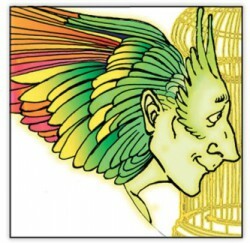 We’ll be rehearsing and performing a unstaged reading of my musical “The Golden Cage” in my studio just outside the Boston Area. If you’re passionate about musical theater, and want to sponsor one of the development phases of this project, email to let me know and I”ll send you more information. My goal? What else but … Broadway. 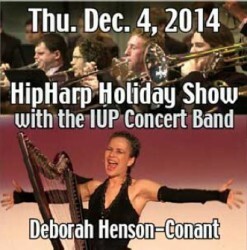 Concert Band and Electric Harp hips out the holidays at Indiana University of Pennsylvania in a special holiday show with the IUP Jazz Band.